This article will show you how to use the RadPageLayout control and its viewport breakpoints to create a responsive layout that changes according to the browser viewport size. The breakpoints represents the predefined viewport sizes at which a LayoutColumn could be set to be hidden (e.g. HiddenSm attribute) or to fit into different Span size (e.g. SpanSm attribute). More about the breakpoints and the available attributes is explained in the Viewport Breakpoints article. 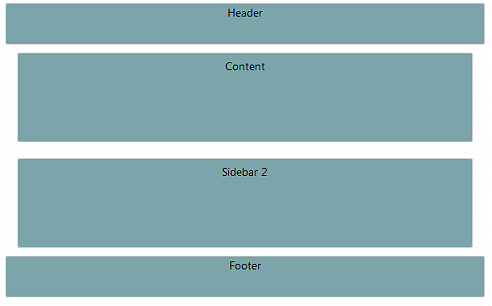 Example 1 shows how to hide the first LayoutColumn and change the Span size of the second and third one when the viewport size appear to be less than 768px. The results of this example can be examined in Figure 1 and Figure 2. Figure 1: Result from the markup in Example 1 when the viewport size is greater than 768px. Figure 2: Result from the markup in Example 1 when the viewport size is less than 768px. Example 1: Using Breakpoints to create a responsive layout.